With many of America's federally employed food-safety personnel on furlough (thanks, government shutdown), it's a good thing there isn't a major foodborne-illness outbreak unfolding across the country! Oh, wait. 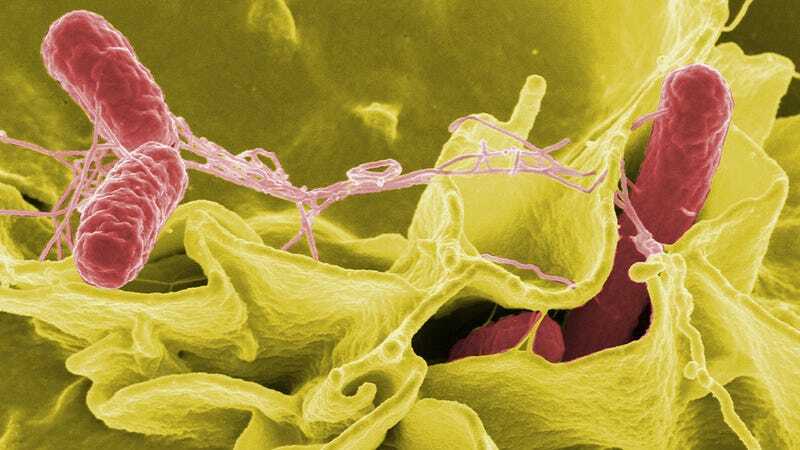 Above: Color-enhanced scanning electron micrograph showing Salmonella typhimurium. The strain implicated in the current outbreak is Salmonella Heidelberg, the nation's third most common strain of the Salmonella pathogen. The U.S. Department of Agriculture announced late yesterday that an estimated 278 people across 18 states – predominantly in California – have recently been reported ill due to Salmonella poisoning. While the USDA's Food Safety and Inspection Service (FSIS) has so far been "unable to link the illnesses to a specific product and a specific production period," initial investigations suggest "that consumption of Foster Farms brand chicken and other brand chicken produced at [three] Foster Farms plants [in California] are the likely source of this outbreak." And that outbreak, the FSIS cautions, "is continuing." Foster Farms, for its part, has yet to issue a recall. "Products are safe to consume if properly handled and fully cooked," reads the press release issued by the company in response to yesterday's announcement. In that same press release, Foster Farms' food safety chief Robert O'Connor insists that the USDA's food inspection process "has not been affected by the recent government shutdown." But according to the Associated Press, the CDC, which helps monitor multi-state outbreaks of food poisoning, "was working with a barebones staff because of the federal government shutdown, with all but two of the 80 staffers that normally analyze foodborne pathogens furloughed." While the AP reports "it was not immediately clear whether the shortage affected the response to the Salmonella outbreak," shutdown memos issued last week by the U.S. Department of Health and Human Services and the USDA both indicated staff relating to food inspection would be furloughed, further indicating that the government was ill-prepared to prevent and respond to a foodborne outbreak. All poultry products should be cooked to a safe minimum internal temperature of 165° F as determined by a food thermometer. Using a food thermometer is the only way to know that food has reached a high enough temperature to destroy foodborne bacteria. Consumption of food contaminated with Salmonella can cause salmonellosis, one of the most common bacterial foodborne illnesses. Salmonella infections can be life-threatening, especially to those with weak immune systems, such as infants, the elderly and persons with HIV infection or undergoing chemotherapy. The most common symptoms of salmonellosis are diarrhea, abdominal cramps, and fever within eight to 72 hours. Additional symptoms may be chills, headache, nausea and vomiting that can last up to seven days. According to the USDA's report, affected products were distributed primarily to retail outlets in California, Oregon and Washington State. The report also notes that raw products from the three Foster Farm plants in question bear one of the following identification codes on their packaging: P6137, P6137A, P7632. After a fair bit of searching, we were unable to come up with a list of the 18 states reportedly affected by the outbreak, though we'll update here when we learn more. The outbreak has already outstripped another nationwide Salmonella outbreak (also linked to Foster Farms), which earlier this year affected an estimated 134 people across 13 states. In the meantime, the CDC has partnered with state health departments to continue monitoring the outbreak while FSIS continues its investigation. More on this as it develops.